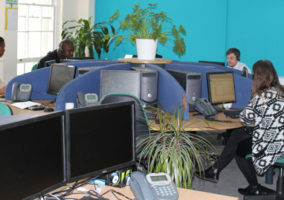 This week Call Centre Helper visited The Money Shop’s call centre in Nottingham, managed by Hayley Plant. 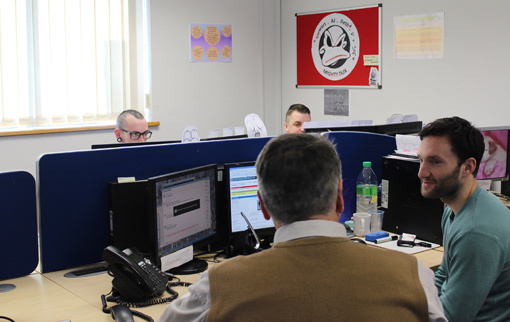 After being given the grand tour, the Call Centre Helper team were each assigned to an agent and given a chance to see the business in action. The lady I sat next to was busy cross-referencing data and ringing customers to confirm how they were going to make their next payment. I quickly learned that this was just one step in a series of gentle reminders designed to stop customer’s payments falling into debt – a far-cry from the nuisance cold-callers that tar the contact centre industry. Despite not being a sales-based call centre, it is still important that agents are closely monitored because The Money Shop are FCA regulated. Therefore any targets set are equally based on quality scoring and customer satisfaction to ensure best-practice; with quality being assessed on an individual basis whilst customer satisfaction is calculated per team. Jonty speaking with one of The Money Shop’s agents. To keep her agents working consistently towards their targets, Hayley has developed some fool-proof tactics to keep her teams smiling. Recent gambits include providing free tea and coffee, as well as free parking, starting a dieting club, having an office sweepstake for the Grand National, and even organising monthly massages for agents – at their desk! All of Hayley’s efforts to make The Money Shop a good place to work have paid off; with an average tenure of 18 months and a 12% attrition rate! Following Call Centre Expo 2012, The Money Shop trialled Therapy Solutions’ in-office massages, claimed to engage and motivate staff, as well as reduce sickness and improve employee performance. Hayley told us that all of her agents now benefit from a monthly massage – courtesy of The Money Shop. Another thing which grabbed our attention was a pin board display of certificates called “The Giraffe Awards” – for employees who’d really stuck their neck out. Hayley explained that this creative spin-off of “Employee of the Month” encouraged peer to peer recognition, as each month’s nominations were put forward by employees; with the overall winner being selected by management and awarded a £25 gift voucher, and some lieu time to go off and spend the vouchers. 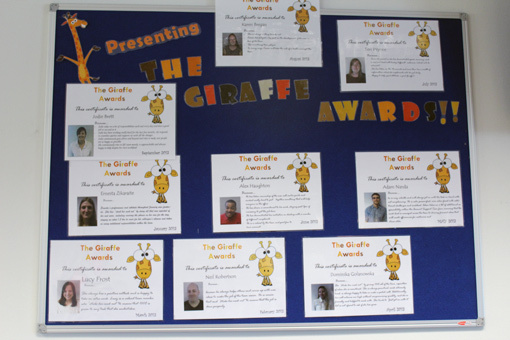 The Giraffe Awards create a colourful display board in the call centre. The Money Shop uses a wide range of technology to keep their operations running smoothly on a day-to-day basis. Most noticeable is their 6 wallboards hanging prominently around the office, all of which are hooked up to real-time, information statistics generator Akixi. The call centre have also recently deployed Scorebuddy, a quality scoring system which we’d not seen out in the field until now. 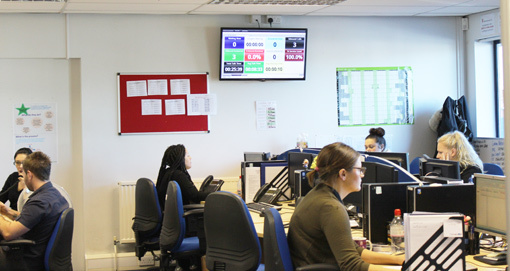 Whereas lots of call centres do agent scoring through ever-complex spreadsheets, The Money Shop uses Scorebuddy to measure the usual scoring areas such as call opening, compliance and key quality skills, as well as a number of floating questions. This makes it far easier to track quality scores across the company. 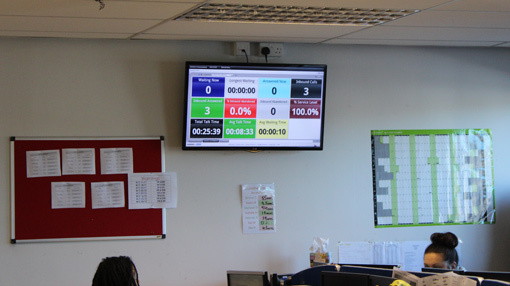 An Akixi wallboard in action. In addition to this, they have also implemented TMS (The Money Shop) TV which runs via an intranet system across all stores and is used to train up their agents remotely; especially useful when training off-shore agents. 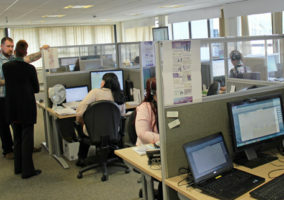 The call centre is also on the cusp of rolling out live chat. They are hoping that this will offer a faster alternative to email communication, which is currently slowed by the need to confirm data protection information. Management also plans to experiment with the call centre’s opening hours, via live chat, once the new system is up and running. The Money Shop has a diverse customer base, with a high proportion of their customers being Polish. In response to this, all of their agents are trained to say “please hold, I will get a translator for you” in Polish (Sprawiają przyjemność trzymają). Agents busy dealing with The Money Shop’s diverse customer base. The Money Shop share best practice with other companies, including Capital One and Experian, across the business park. 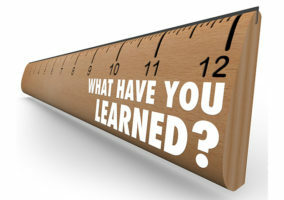 This includes inviting one another to educational events, such as best-practice seminars. The call centre operates a smart/casual dress code, but are strict about what their agents can and can’t wear. For example, girls are not allowed to wear leggings or Ugg Boots, and polo shirts can be worn but only if they are ironed and tucked in. Their dress code is written by their HR department, and failure to adhere to it can result in agents been sent home (without pay) to change into something more appropriate. 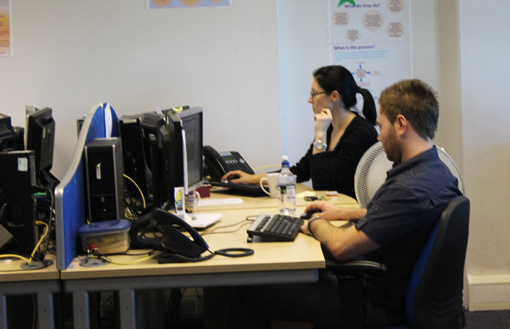 What lessons could a call centre manager learn from the BBC TV show “The Call Centre”?